You’re all about to hear some funny stories about the outrageous, silly, and memorable things I’ve done for the love of books. For anyone who didn’t already know, I was a preacher’s kid growing up, so the church’s building was basically my family’s second home. We were there two or three times a week on average, and sometimes way more than that if there were weddings, funerals, potluck dinners, vacation bible school programs, or other events going on. This fact only makes the first two items on my list even more amusing than they might have been for the average kid. The rest of my list is about non-church-related stuff. I will (probably) not use gifs for the next Top Ten Tuesday, but I couldn’t help but to use them again this week. I believe this happened on one of those weeks when we’d spent way more time at church than usual. At any rate, I quietly walked out of the service, hid in a closet, and read a book about missionaries for a while. It was a good story, I enjoyed the break, and I did not tell this story to my parents until many years later. (They were amused by it). This happened at a religious conference I attended when I was about twelve. I was a dancer then and loved the dance portion of that conference that showcased all sorts of new moves and styles for worship service dances. After a few days of spending hours listening to sermons on unrelated topics, though, I decided to sneak a book in and read it when no one was looking. What makes it even funnier is that I was reading a sometimes-steamy series of romance novels that weekend! My family was on a camping trip when this happened, and I’d brought along a short story collection with me because who wants to go on vacation without a book?! (This theme will repeat again later on because I am a creature of habit). I wanted to read just one more tale before bed, but I ended up falling asleep with my flashlight on. When I woke up again, the battery was completely worn out. Not only was I a preacher’s kid, I was homeschooled as well for several years. One of the first things I did once I started attending public school was borrow books from the school library and hide them underneath my pillow. For some reason, I thought I wasn’t allowed to read them. It was a relief when my mom discovered them and didn’t make a big deal out of it at all. There were obviously other factors I considered as well, but the libraries were the very first spots I visited on my unguided tours of these facilities. The fact that I liked those libraries so much made it easier to pick the institutions of higher learning that I did. Yes, being situated close to a nice library has been a factor when I decided where to move to in the past! I’ve found that any neighbourhood that has a well-tended, busy library tends to have a lot of other perks, too, like having more free community groups/events and the neighbourhood cultivating a friendly, welcoming attitude towards newcomers. The gif above is from an amazing puzzle game called Monument Valley that also asked its audience to solve a mystery about a civilization that had disappeared. I can’t recommend it highly enough. Monument Valley set a high standard for me as a gamer. These days I’m only interested in games that have tight, engaging storytelling woven into whatever else they happen to be about. I like figuring out which literary character is most like the various people I know. You’ll never hear who I’ve pegged you as unless you ask, but there’s something satisfying – if also occasionally a little unusual – about deciding that someone reminds me most of Hermoine, Bilbo Baggins, Jo March, or any other number of characters. Sometimes it has taken so long to wait for a medical appointment or visit a loved one who has been admitted that I must overcome my aversion to germy waiting room books and see what a hospital/doctor’s office waiting room has to read. 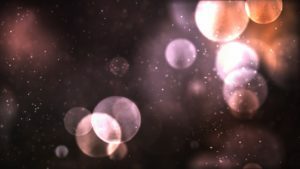 Then I imagine all of those bacteria multiplying on my skin and wash my hands with lots of soap and hot water because the thought of getting sick from touching the wrong types of germs makes me nervous. Ha! One year when my family was on a beautiful beach vacation, teenage Lydia convinced my parents to drive to a local mall so I could pick up a few new books when I unexpectedly finished reading everything I’d brought with me. I was thrilled when they agreed to do this and portioned out my reading time better for the rest of that trip. How many of these things have all of you done? I can’t wait to read your responses to this prompt. It sure was a fun one. 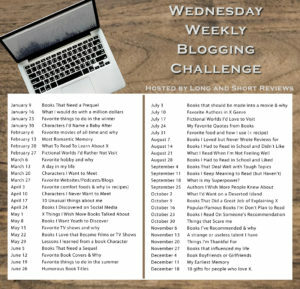 Wednesday Weekly Blogging Challenge: Comfort Foods and Recipes and Whys, Oh My! This week’s topic is “Favourite Comfort Foods & Why (& Recipes),” so of course I just had to play around with the wording of it a little in the title of this post in order to sneak in a reference to The Wizard of Oz. I will now proceed to answer the prompt (mostly) seriously. Both of my parents grew up in the Mennonite community and have the same general ethnic origins: German and French. In fact, all of the ancestors we’ve traced so far came from the Alsace-Lorraine area that was sometimes part of Germany and sometimes part of France depending on which century you’re looking at. If your ancestors ever so much as glanced at that corner of the globe, we are probably third cousins or something. Ha! 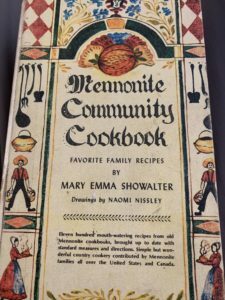 All of the recipes I’m about to share were either printed in the Mennonite Community Cookbook that I’ve attached a photo of to this post or written on the blank pages of that cookbook. To the best of my knowledge, they are all traditional German-Mennonite dishes for people from that group who live in Midwest portions of the United States. This is what ground cherries look like. Photo credit: Pen Waggener. 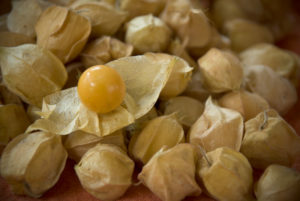 If you happen to live in North America, your best best for finding ground cherries would be at your local farmer’s market during the summer or autumn. They’re a tomato-like fruit that’s less sweet than most other fruits. I sure think they taste good in a pie. My grandmother makes this pie often. I think happy thoughts about her every time I eat it. Begin by boiling the water. Add the rest of the ingredients one at a time, and allow the water to go back up to a boil before adding the next ingredient. After you’ve added as much food colouring as desired, pour the mixture into a pie shell. Add the top crust (if desired), and then bake your pie at 400 F for 15 minutes. Then turn the temperature down to 350 F and bake for another thirty minutes. It should have a consistency similar to other fruit pies when it’s finished. Serves 6-8. I don’t have a picture of this recipe, but it’s something one of my grandmothers used to make. It’s delicious. Grate 6 boiled potatoes . Add eggs, salt, and flour. Beat this mixture until fluffy. Roll it into balls with 2-3 croutons in the centre of each ball. Dump the balls into gently boiling salted water for 10 minutes. Drain well and serve. A little sour cream on the side of your plate would do wonders with this dish if you’re so inclined. 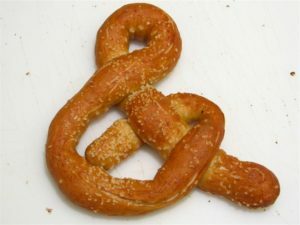 I strangely couldn’t find any of the photos I’ve taken of my own soft pretzels over the years, so I grabbed one off the Internet. You could even make them in fancy ampersand shapes if you wanted to! In a small bowl, dissolve yeast and 1 teaspoon sugar in 1 1/4 cup warm water. Let stand until creamy, about 10 minutes. In a large bowl, mix together all of the ingredients except the flour. Add in the flour one cup at a time. You might need as few as three cups of it. Mix and form into a dough. If the mixture is dry, add one or two more tablespoons of water. Knead the dough until smooth, about 7 to 8 minutes. Lightly oil a large bowl, place the dough in the bowl, and turn to coat with oil. Cover with plastic wrap and let rise in a warm place until doubled in size, about 1 hour. Preheat oven to 450 degrees F (230 degrees C). Grease 2 baking sheets. In a large bowl, dissolve baking soda in 4 cups hot water; set aside. When risen, turn dough out onto a lightly floured surface and divide into 12 equal pieces. Roll each piece into a rope and twist into a pretzel shape. Once all of the dough is shaped, dip each pretzel into the baking soda-hot water solution and place pretzels on baking sheets. Sprinkle with kosher salt. Bake in preheated oven until browned, about 8 minutes. Serves 12. I found this recipe in the cookbook mentioned above, and I know have ancestors who ate whatever they could find when food/money was scarce based on certain family legends. To be fair, that hasn’t happened in a few generations so this doesn’t quite count as a comfort meal. I’d like to try it someday, though! 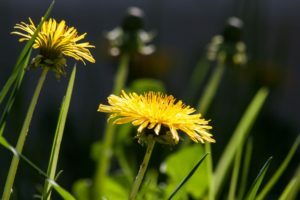 Have any of you ever eaten dandelions or other wild greens? To make dressing, stir together the dry ingredients, add egg, vinegar, and water. Stir until well blended. Cook dandelions in bacon drippings until thickened and cool slightly. Pour dressing over dandelions and mix lightly. Garnish with sliced or chopped eggs and the crips bacon. Serves 6. Click here to read everyone else’s replies to this week’s question. The image below is the list of upcoming prompts for this blog hop. Lately, I’ve been thinking about climate change and how the expectations of what winter, or any other season, will be like in the average year are changing. The official graphs and charts that show how rapidly the average temperatures are climbing from one decade to the next are obviously quite important, but I think there’s something to be said for listening to and writing down anecdotes about the climate as well. Future generations might like to know what things were like when we were young and the Earth was colder. 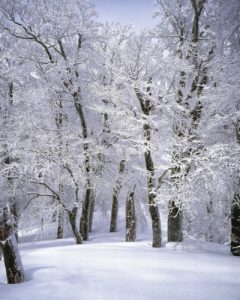 My first clear memories of winter happened in the early 1990s. My family lived in Wyoming then, and our town was nestled so close to the Rocky Mountains that we regularly saw heavy snowstorms between the months of October and May. I think my family was snowed in at least once during these storms. There is only so much plowing that can be done before the blizzard wins and everyone needs to stay off those slippery roads for safety reasons. In the mid-1990s, my family moved back to Ohio. Every year we’d generally have at least a few days cancelled due to snow or ice storms. Ohio was a less snowy place than Wyoming, so I don’t remember quite as many times when the roads were closed due to storms as they did when we lived out west. I do remember feeling a little surprised by the lessening amounts of snow as the years rolled on. Part of it was almost certainly due to the fact that I was growing into my full adult height and viewing snowdrifts from that perspective instead of the point of view of a young child, but I also wonder if I wasn’t noticing the effects of climate change. The winter of 1998-1999 was an exception to that trend. We had a huge snowstorm at the tail end of Christmas break that delayed the reopening of school by about two weeks. My family just so happened to be moving into a new house then, so my first recollections of 1999 were of perpetually-damp boots, gloves, and hats drying by the radiator while we unpacked our belongings one minivan full of them at a time. I moved to Toronto in 2005. The climate was fairly similar to Ohio, but I’ve noticed winters seem to be morphing into drier and more erratic versions of themselves here over time. We still have some snowstorms, but we’ve also had weird weeks in the dead of January or February where the temperatures climb into early spring numbers (10-15C, or roughly 50-60 degrees Fahrenheit for you Americans) for a day or even a week before growing cold again. This is truly bizarre, and I wonder if it will become the new normal for future generations. Will they no longer need heavy winter jackets, gloves, hats, and scarves? How will they react to the thought of a winter that doesn’t thaw out again until March? I suspect they won’t understand that concept at all, except as an academic exercise when they read about what life was like before climate change. 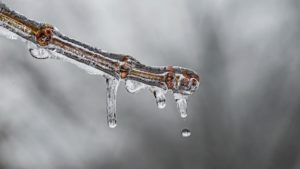 I’m interested in hearing your stories about how winter has changed and is changing where you live. If you live in a climate that doesn’t have winter, feel free to talk about how the weather is changing in whatever ways you might have noticed since you were a kid. Today’s post is a little off the beaten path, but I do occasionally enjoy sharing snippets of my life that aren’t related to writing, science fiction, fitness, or mindfulness. As I discussed in Things Nobody Tells You About Moving to Canada, I’m an immigrant. I was born and grew up in the United States. When I was in my early 20s, I moved to Canada and have called it home ever since. 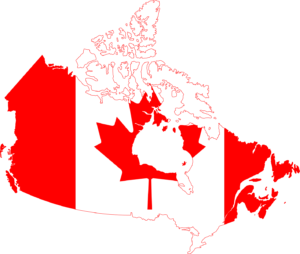 Canadians and Americans generally both speak English. With the exception of a few quirky words like chesterfield and toque, we normally understand each other’s dialects without any issues at all. The U.S. and Canada have remarkably similar etiquette rules and social customs. It was rare for me to accidentally step on someone’s toes when I first moved to Toronto and began adjusting to the cultural differences that I did notice here. People in both countries tend to have access to similar sorts of foods throughout the year. While there are a few special foods in each nation that I can’t find when I cross the border, all of the staples in my diet can be found anywhere I might roam in Canada or the U.S. The weather wasn’t much of a change, either, since Ohio and Toronto are so close to one another geographically speaking. I didn’t have to suddenly trade my entire wardrobe in for one meant for a much hotter (or colder) climate. With that being said, there was one thing about moving to Canada that surprises me to this day. You see, I grew up in a very patriotic country. I routinely saw American flags decorating people’s cars, homes, shoes, tattoos, toys, t-shirts, and assorted foods among many other items. When the Fourth of July rolled around every summer, many of the people my family knew threw huge barbecues or other backyard parties to celebrate it. Sometimes we might have even attended more than one of them on that long weekend some years due to my father’s prominent role in the community as a minister. There were always fireworks, both the legal kind that were set off by the city and the semi-legal to illegal types that people sneakily ignited in their backyards off and on during the first week of July. At any other time of the year, I’d assume that a loud popping noise was a car backfiring or, much less likely, gunshots going off. During the week we celebrated Independence Day*, it was fireworks without a doubt. *Yes, non-American readers, it’s just as contradictory as it sounds. I have no idea how what should have been a one-day celebration ended up being spread so far, but it did. The way Americans talked about their country was different as well. I’d often hear people say that we lived in the best place on Earth and that we didn’t know how lucky we were to have all of the freedoms we enjoyed. This wasn’t even necessarily done to be boastful. It was closer to a matter-of-fact response to the thought of our country turning another year older. There was a sense of pride in their voices and body language that couldn’t be ignored. Everyone presumed to know that this was the truth. It was all such an ordinary part of life that I honestly didn’t think about it twice. I assumed that every country had a similar holiday they seemed to relish just as much as our own. Due to these early life experiences, I looked forward to Canada Day earnestly when I first moved up here. It occurred so closely to the Fourth of July that I couldn’t wait to take notes and find out which traditions, if any, might be different between my birth and chosen countries. Imagine my surprise, then, when the Canadians around me didn’t seem to be all that fussed over Canada Day as the first of July crept closer and closer. Oh, there were a few advertisements in the local grocery store for barbecue-friendly meal ideas. The Canadians I’d met seemed to be happy to have a day off from work and school as well. But they weren’t exuberant, and the Canadian flag wasn’t plastered on everything you could possibly imagine and a few things you maybe couldn’t. Their patriotism was subdued at best. Nobody decorated the outside of their homes in large swaths of red and white to celebrate this special day. Nobody swore up and down that Canada was the best country on Earth either. If anything, Canadians seem to be a little bashful on this topic. It can be hard to get them to understand just how lucky we are to live in a society whose safety net is so much more secure than it is south of the border. By no means is my adoptive country perfect, but a part of me is always amazed to see a doctor when I need to without worrying over how much they’ll charge me for the treatments I might need. The handful of Canada Day barbecues I’ve attended have been much more about the food than about taking pride in one’s country. This is a quiet way to observe the founding of Canada. While it wasn’t at all what I was expecting when I moved up here, I’ve come to appreciate the subtleties of it all. 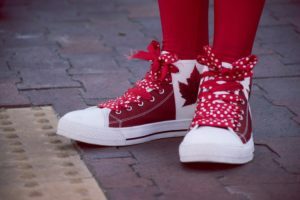 If you celebrate Canada Day, what do you do for it? What Is the Perfect Reading Spot?